Leicester and Claudio Ranieri are the toast of the town, but Bryan Whitelock is raising his glass to another master; Mauricio Pochettino. Following the dismissal of Nigel Adkins, a low-key hero of the Southampton faithful, Mauricio Pochettino was announced as Southampton manager on January 18th 2013, to much confusion and apprehension of fans throughout the country, especially those in the red and white of Southampton. Adkins has previously led The Saints to successive promotions from League One into ‘the big time’. Securing Premier League football must have been the aim, right? Obviously. But Southampton Chairman Nicola Cortese had further ambitions, citing the appointment of Pochettino as being made for “the long-term ambitions of the club”. 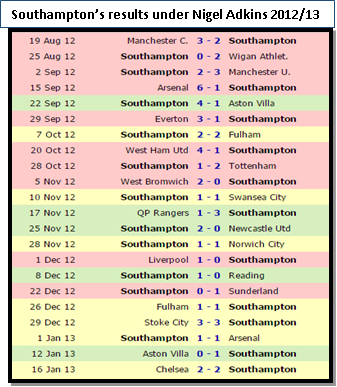 The sacking of Adkins seemed harsh, especially with Southampton sitting three points above the relegation zone and going through quite a rich vein of form, being unbeaten in 5. Pochettino was virtually unknown in England, the only slight recognition was for giving a penalty away against England in the 2002 World Cup, leading to a penalty converted by David Beckham in a tight 1-0 encounter. By jumping in at the deep end in the middle of the season, Pochettino had only half of the season to adapt to the Premier League and change the team to suit his style. First and foremost, however, results would be top priority to keep fans happy and secure their Premier League status as quick as possible. It wasn’t long before people were taking notice of the action down at St. Marys. Wins against Manchester City, Liverpool and Chelsea highlighted the effectiveness of Pochettino’s ruthless pressing style, causing problems even for the very best teams in the country. The dynamic, fast-paced transition from defence into attack was vital in securing these victories and earned praise from fans and pundits alike. 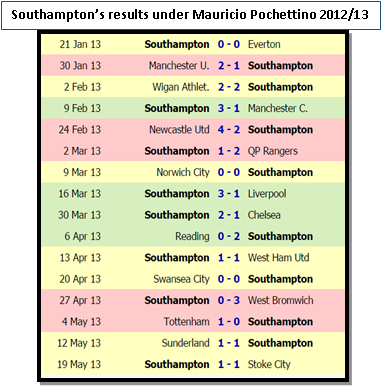 People were starting to notice Mauricio Pochettino and his Southampton. Pochettino’s Southampton possessed a better win percentage, loss percentage and all round better goal statistics as his Southampton improved in the latter half of the season to comfortably secure their Premier league status to build on for future seasons. Building on the success of his previous season, Pochettino reinforced his squad with quality and not quantity. Lovren was brought in from Lyon for £7.5m to strengthen the spine of the team and add quality in defence. The centre back was a real statement of intent due to his experience, solid defensive qualities and on-the-ball ability, a key component in any Pochettino player. Another signing to strengthen the spine was Victor Wanyama who had been linked with several big-name clubs, leading Southampton to snatching him up quickly. 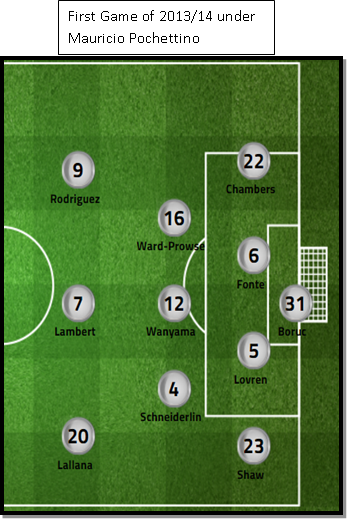 Lovren and Wanyama were both key reasons for Southampton defensive improvement in which they kept 6 clean sheets in the first 9 games of the 2013/14 season. Osvaldo, a player who played under Pochettino at Espanyol, was the final signing of the transfer window for a record £11.33m – another statement of intent from The Saints. Although he did not set the league alight it was still a potent signing which strengthened the squad and added goals to the team, most notably his leveller against Manchester City. The summer signings along with an improvement of the starters from the previous season led to a strong start to the 2013/14 season which didn’t derail. It was not just at the back in which Southampton impressed, however, the attacking trio of Lallana, Lambert and Rodriguez who also impressed which led to interest from big clubs in the country and England manager Roy Hodgson. Pochettino also made use of Southampton’s excellent youth academy, famous for the talents of Bale, Walcott and Oxlade-Chamberlain to name a few. Youth plays a big part in Pochettino’s philosophy as hunger, determination and passion tends to be part of a young player’s mantra. This hunger coincided with natural talent breeds the type of player that can be successful under Pochettino’s watchful eye. The talents of James Ward-Prowse and Luke Shaw were displayed under Nigel Adkins but Pochettino gave them more chances to impress and undoubtedly improved them as players. With the improving talents of Ward-Prowse and Shaw, 3 other Southampton youth players got chances throughout the season. Pochettino is also not afraid to push the young players in at the deep end. He put faith in Sam Gallagher to start him against Arsenal at just 18 years old. He also gave debuts to Calum Chambers who became a vital part of the team at right-back and the talent of midfielder Harrison Reed who also got minutes under his belt throughout the season. Pochettino made minor changes to the team he inherited but it made a large difference as he led Southampton to their then highest ever place in Premier League of 8th and their then-highest ever points tally of 56. Wanyama and Lovren, the summer signings, were a main stay throughout the season and the full backs were changed to a youthful look of Chambers and Shaw, offering pace and a fearless attitude down both flanks. Schneiderlin was a vital cog in the team in both seasons but it was under Mauricio Pochettino which he really developed which also led to him being courted by England’s biggest clubs, most notably Arsenal and Manchester United. The change in the team is reflected by the change in results, an improvement upon the previous season. 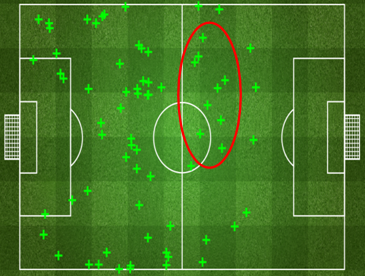 The main improvement was in defence which led to fewer losses and more points through this defensive solidarity. With more wins, goals and clean sheets and fewer losses and goals conceded, Pochettino was beginning to make his mark. 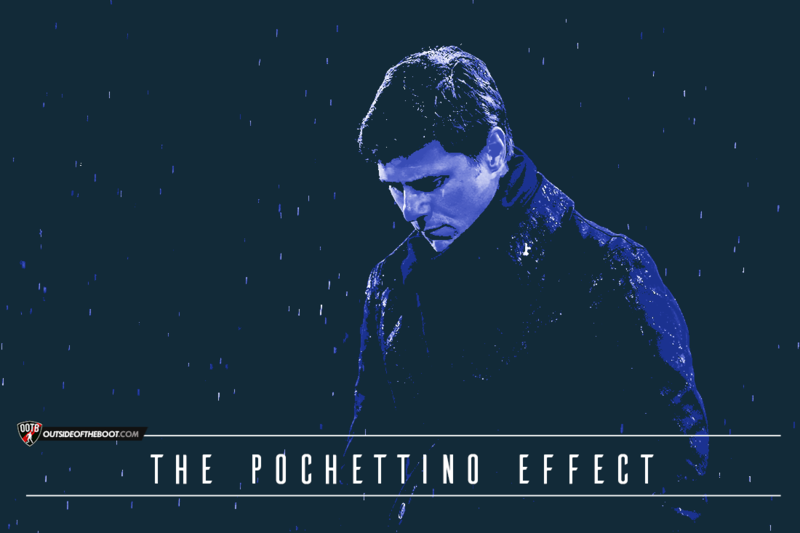 Pochettino also changed the tactics of Southampton to match his blueprint of hunger, passion and quick transition. This high press and intent on winning the ball higher up the pitch can be seen by the ball recoveries from his first game in charge in comparison to one of his last games in charge of Southampton. A lot of ball recoveries were made in Pochettino’s first game in charge with the youthful side wanting to impress the new manager. 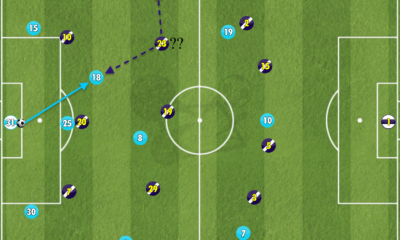 The majority of ball recoveries are deep in the middle third and at the start of the final third due to tactics implemented to be defensively solid. In one of Pochettino’s final games in charge, Southampton made more ball recoveries with a higher amount of ball recoveries taking place in the start of the middle third. These ball recoveries are higher up the pitch than in his first game in charge, highlighting his-high pressure tactic and evidence of its application. Andre Villas-Boas was the man in charge of Tottenham for their away fixture to Manchester City in the 2013/14 season. With new players being brought in and the squad yet to gel, problems were on the horizon. Navas set the scene instantly with a goal in the first minute and it didn’t get better from then on. 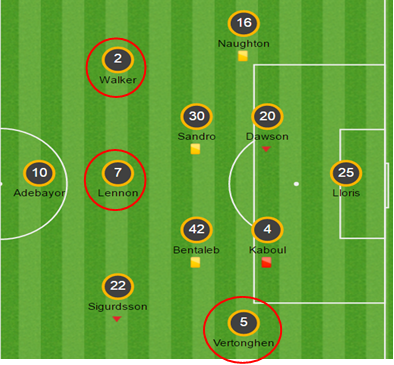 There was no real direction from this Tottenham side, no ideas, no passion. From the recruitment in the board room to the on-field performances, Tottenham’s performance was a shambles. 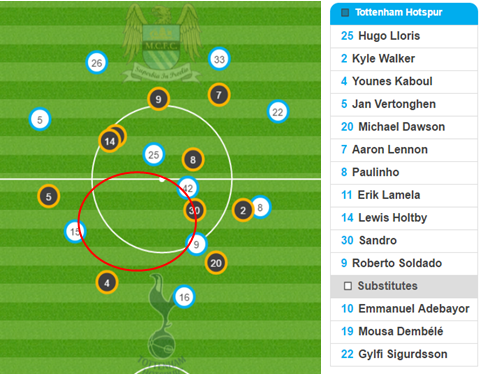 Tottenham were 3-0 down by half time and City were running riot. 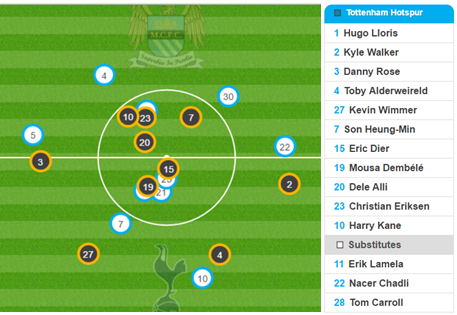 The graphic shows how open Tottenham were with particular space in front of the back four for the likes of Aguero, Tevez and Yaya Toure to exploit. Villas-Boas later stated he was “ashamed” by the performance and it was “extremely embarrassing”. “The worst defeat for everyone at Tottenham”. With Tottenham no longer backing Villas-Boas, Tim Sherwood was promoted to take over until the end of the season. However, performances did not get much better, highlighted in the 4-0 hammering away at Chelsea. They were still paying for their poor summer recruitment with many players being playing out of position. 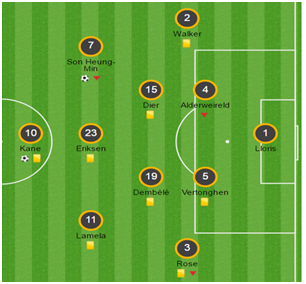 Vertonghen was pushed to left-back, Walker was pushed to right-wing and Lennon was playing as a playmaker in the number 10 role. Tottenham were saved by the brilliance of Bale in previous seasons but he was now chasing dreams of his own in the Spanish capital following his world record move to Real Madrid. Tottenham were left with no star player but a mammoth war chest from Levy’s tough negotiations. 7 players were brought in under the reign of Franco Baldini of which 4 were later sold having been deemed surplus to requirements by Pochettino. Pochettino had to refigure his team in the transfer market by bringing in young players for low prices coupled with some relatively recognisable players for larger prices with more experience. Below is a table of Tottenham’s transfer activity with selected players. With a squad assembled by Pochettino, the manager, and not by sporting director Franco Baldini, Tottenham had a clear vision with a distinct style of play that would earn plaudits and recognition throughout the country. Only 2 players remained from the team hammered by City over 2 years earlier. 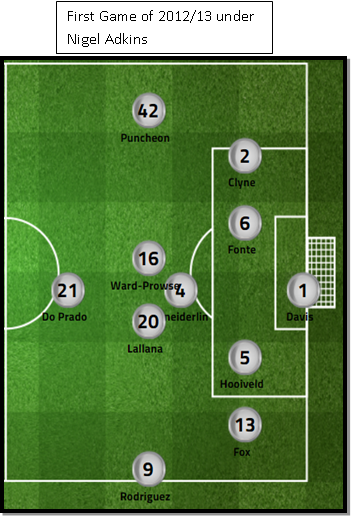 Their shape was much more compact, particularly in central areas, to combat the technical ability of City’s players. The full backs were pushed higher up the pitch and stayed wide to offer a constant outlet on both flanks which caused City problems all game which led to City’s more technical players like Silva often tracking back into defensive positions instead of roaming freely. With a much better squad than in previous seasons, Tottenham grabbed a winner after being pegged back to 1-1 with the introduction of Erik Lamela who was finally achieving his potential under Pochettino after a difficult start to life in England. More evidence of Tottenham’s great squad was Kevin Wimmer who slotted in for the injured Vertonghen. Wimmer was outstanding throughout against the threat of Aguero and he also started many of Tottenham’s attack from his confident passing out from the back. Tottenham had character and fight, the complete opposite of this fixture 2 seasons previous. On a night which Leicester could win the title if Tottenham failed to win, everyone was rooting for Chelsea to secure Leicester’s fairy tale. 2 years earlier Tottenham were trying to break into the top 4 but this year they came to Stamford Bridge aiming to keep their title hopes alive. Much had happened over 2 years and Tottenham were on the right track. In stark contrast to the team that played at Stamford Bridge 2 seasons earlier, Tottenham had a well-balanced side who played together consistently all season. Dele Alli was suspended for the match following his ban for striking West Brom’s Claudio Yacob in the previous game but it was that type of aggression and fight that was missing in previous seasons from this Tottenham side. Much of Tottenham’s success is down to the rising starts of the team, Pochettino’s English core. The young, fearless attacking full backs Walker and Rose open up avenues and space for the midfield talents to work their magic. Walker’s progress had stagnated since the 2012/13 season in which he was named the Professional Footballers’ Association Young Player of the Year. Pochettino has got him back to his best in terms of his attacking prowess but has also improved his defensive side of the game to make him a better all-round player. Rose was also a rising talent for the future when he made his league debut at home to Arsenal, scoring a well-struck volley from well outside the area but he did not kick on and improve or become a first team regular. Under Pochettino, Rose has made the left back position his own with lung bursting runs from left back and tenacious defending. Dier plays the anchor role in midfield which offers a defensive stability to the team, allowing Walker and Rose to maraud up and down the flanks. In the previous season, Dier played a variety of games at right back and centre back to display his versatility. Pochettino identified Dier’s qualities and trusted him in midfield to great success in which he is now an indispensable part of the Tottenham line up. It’s hard to think of a Tottenham side without the goal-scoring ability of Harry Kane and where they would be without him but Pochettino’s gamble on the youngster was well worth it. The young England star scored 20+ goals in both of his first 2 Premier League seasons, leading Tottenham to a Capital One Cup final in Pochettino’s first season and a title challenge in his second. Kane also picked up the golden boot for his 25 league goals. Some of this English core of players were given a chance under previous regimes and it is inevitable that most of the others would have got a chance in the future but it’s hard to imagine that they would match the level of performances that are being achieved under Mauricio Pochettino. Pochettino is certainly having an effect on the youngsters at the lane. Part of the Mauricio Pochettino way is to develop youth and give them a chance to impress. He did it at Southampton and he is doing it again at Tottenham. In the 2013/14 season, Ryan Mason was on loan at Swindon Town, racking up a total of 1,372 which was a key development for the future of Mason. In Pochettino’s first season in charge, he gave Mason an extended chance to showcase his quality and develop further as a player as he amassed a total of 2,609 minutes on the field across the Premier League, League Cup and Europa League. If it was not for injuries, Mason would have racked up more minutes in the 2015/16 season as Pochettino continues to give him minutes. Another player with a bright future is Tom Carroll who, similarly to Mason, found himself out on loan during the 2013/14 season. Carroll featured regularly for Championship side QPR as they plotted a way back to the Premier League, giving Carroll a total of 1,999 minutes as he impressed with his technical ability. Pochettino gave him his chance in the Premier League and he also featured in cup games for Tottenham during 2014/15 season as he featured in 951 minutes’ worth of action. Carroll was given more Premier League games in Pochettino’s second season as he featured in 19 league games in comparison to the 13 he featured for Tottenham in the previous season. He was continually given games in the Europa League and both domestic cups as he spent an improving 1,193 minutes on the field in all competitions. Maybe the most unrecognisable name of the three players is young attacking midfielder Josh Onomah who is part of the youth team at Tottenham. He spent the vast majority of Pochettino’s first season playing for the U21s but he did feature for Tottenham as he was given his debut in a Third Round FA Cup Replay at home to Burnley in which they ran out 4-2 winners. The following season Onomah featured more regularly playing in 18 games for Tottenham across the Premier League, FA Cup and Europa League as he played in 518 minutes’ worth of action for the North London side. Despite challenging for the title, Pochettino gave youth a chance in the 2015/16 season and arguably they would not be fighting for the title if it was not for his trust in youth. By playing youth players so regularly it shows his trust in the younger players no matter what age which can only be a good thing for the future of the players and the future of Tottenham. The majority of the English players to have worked under Mauricio Pochettino have gained recognition at national level, leading to many debuts for Pochettino’s men. It first started to take place at Southampton with Rickie Lambert being first involved in the England set up as he netted a goal on his England debut against Scotland, much to the impact of Pochettino. More and more Southampton players were called into the England squad and were featuring for their national teams throughout the season as Pochettino developed them all into better players. It was the same scenario at Tottenham with young players improving at club level and no doubt improving their national side as well. Kane also followed in the footsteps of Rickie Lambert as he came on as a substitute for his debut, netting a minute later as he lit up Wembley. The same can also be said about Dele Alli who is mirroring his match winning performances for Tottenham with England as he netted on his full debut against France with a long range pile driver and he also picked up a man of the match award against Germany as England came back from 2-0 down to run out 3-2 victors. The future of Tottenham in the next few years may well depend on if they can keep Pochettino at the helm. Pochettino recently signed a two-year contract extension which will keep him at the club until 2021 and will see him take his young team into their new stadium. The upcoming summer transfer window will be an important one in order to strengthen their squad to progress to the latter stages of the Champions League and launch another title charge. Youth development is another part of the future for Tottenham with Pochettino in charge. 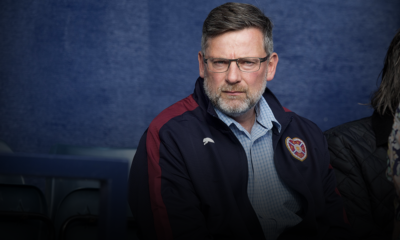 His intent on bringing through youth players and developing them by giving his young players minutes in the side will be important to strengthen the squad and unearth any gems that may lay in the youth sides. It will not just important for Tottenham that youth is given a chance but also for England as many of the Tottenham team are expected to play a part for England in the European Championships this summer. If Pochettino stays until the end of his contract and he brings through more youth players along with any marquee signings into the new stadium, who knows how far this young Tottenham team can go under his guidance. Bryan loves the tactical aspect of football and how different tactics create different playing styles. He also loves statistical analysis and people's different ideas and opinions on football. Bryan hopes to see England dominate like the Spanish team of yesteryear, although he is not expecting it any time soon.